The White House says it cannot confirm reports that Ukrainian troops destroyed a Russian military convoy that had allegedly crossed into eastern Ukraine. Spokeswoman Caitlin Hayden said late Friday officials are working to gather information on the situation. She said the U.S. remains concerned about repeated Russian and Russian-supported incursions into Ukraine. Earlier Friday, Ukraine’s president said government troops destroyed a column of military vehicles that crossed into eastern Ukraine from Russia as a convoy of Russian trucks purportedly carrying humanitarian aid remained stalled near the border awaiting inspection. A top separatist official in Donetsk also dismissed the assertion, saying it was in fact separatist fighters that had ambushed a Ukrainian military column. Tensions between Russia and Ukraine have neared boiling point in recent days, as the convoy of more than 250 trucks journeyed south from the Moscow region to the two countries’ border. The Kremlin has insisted the trucks are carrying food and supplies for residents in the besieged Ukrainian city of Luhansk and other locations. Kyiv and Western officials, however, fear they could be used as a pretext for a full-scale Russian invasion. 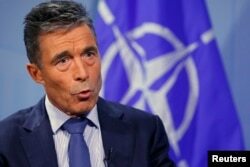 NATO Secretary General Anders Fogh Rasmussen speaks during an interview with Reuters at alliance headquarters in Brussels August 11, 2014. Now in its fifth month, the Russian-backed insurgency has sent relations between Moscow and the West to Cold War levels, and prompted major Western sanctions in an effort to persuade President Vladimir Putin to scale back his support for rebels. A statement on President Petro Poroshenko’s official Web site said Ukrainian troops had destroyed a significant portion of the military column, which reportedly involved Russian armored personnel carriers and other vehicles. The statement also said the military vehicles were crossing into Ukraine, about 20 miles from where the Russian aid convoy was stopped. It was unclear if the column was officially part of the Russian armed forces, or operated by Russian-backed rebels. Several Western media outlets reported the crossing early Friday. According to a statement posted on the the president's website, Poroshenko told British Prime Minister David Cameron about the development during a telephone call. European Union ministers on Friday urged Russia to put an "immediate stop" to all forms of hostilities near the Ukrainian border. "It is a clear demonstration of continued Russian involvement in the destabilization of eastern Ukraine,” Rasmussen said, speaking in Copenhagen. Russia's Defense Ministry, however, said no such military force had crossed the border. "There was no Russian military column that crossed the Russian-Ukrainian border either at night or during the day,” state news agency RIA Novosti quoted the ministry as saying. Alexander Zakharchenko, the self-proclaimed prime minister for the Donetsk People’s Republic, told VOA that the vehicles that were attacked were in fact Ukrainian and were attacked by rebel fighters, who seized weaponry and other equipment. Russia should "put an immediate stop to any form of border hostilities, in particular to the flow of arms, military advisers, and armed personnel into the conflict region, and to withdraw its forces from the border,” the ministers meeting in Brussels said. The United Nations said it could not verify the reports of the column being destroyed. "Such reports point to the urgent need for immediate de-escalation and a resolution of the conflict through dialogue," spokesman Farhan Haq said. Earlier Friday, there were conflicting reports whether Ukrainian customs and borders had started inspecting the humanitarian convoy. Ukraine’s border service said the inspection had begun, but a top security official, Andriy Lysenko, later denied that, saying authorities hadn’t yet received a detailed listing of the trucks’ contents. The International Committee of the Red Cross, which Russia said would participate in the aid distribution, also suggested that no inspections had begun as of late Friday afternoon local time. Swift action was needed to allow “confirmation of the strictly humanitarian nature of the cargo,” the Geneva-based organization said. Much of eastern Ukraine lacks medical supplies, water and electricity, as Ukrainian forces have pressed their offensive . Russia, which has denied directly arming the rebels, has said the convoy was aimed at alleviating suffering in the city of Luhansk and other parts of eastern Ukraine. Meanwhile, two of the most senior pro-Russian separatists battling Ukraine forces near the Russian border quit Thursday, as Ukrainian troops pummeled locations near the rebel-held cities of Luhansk and Donetsk. Artillery shells struck the center of Donetsk for the first time since rebels launched their rebellion against Ukrainian rule in April. Western news reports say at least 25 people were killed in the Donetsk shelling, while Ukraine reported nine troops killed. The departures of Igor Strelkov and Valery Bolotov came as Russian President Vladimir Putin met with lawmakers in Crimea, the Black Sea peninsula that Russia seized from Ukraine and annexed earlier this year. The departure of Strelkov and Borodai had prompted speculation that recent battlefield losses had forced the rebels’ Russian backers to push for leadership changes. Zakharchenko, however, denied reports that the insurgents’ leadership was in disarray. In an interview with VOA Friday, Zakharchenko said Strelkov was on vacation before taking up a more regional post overseeing insurgency activities in both Donetsk and Luhansk. Russia's actions in Crimea and along the Ukrainian border have deeply worried countries like Latvia, Lithuania and Estonia, former Soviet states that are all now members of NATO. The three Baltic nations, along with other countries like Poland, have called for a greater NATO military presence in eastern regions, to deter Moscow from repeating tactics it has used in Ukraine. On Friday, the White House announced President Obama would be traveling to Estonia next month to meet with the Baltic leaders about Ukraine. The statement made specific mention of the central clause to the alliance, Article V, which says that an attack on one member is considered an attack on all members. “In light of recent developments in Ukraine, the United States has taken steps to reassure allies in Central and Eastern Europe, and this trip is a chance to reaffirm our ironclad commitment to Article V as the foundation of NATO,” the statement said. VOA's Margaret Besheer contributed to this report from the United Nations. Some information was provided by AFP, the Associated Press and Reuters.